With Winter right around the corner, we need to start protecting our skin from drying out on these cold days. Carmex, who is known for their amazing lip balms(which i love btw), now has a skin care line to help heal, soothe, and moisturize your dry skin. I got to try out their Healing Lotion and Cream and also received travel sizes. The Carmex Healing Lotion contains Aloe and Vitamin E to nourish and moisturize. It is to be used daily to help protect skin and keep dryness away. The Carmex Healing Cream has 9 healing ingredients to help repair your driest, roughest skin. Both are non greasy and will definitely keep your skin feeling smooth and soft. It's the very faint scent of Carmex lip balm that bothers me... you know... that menthol and camphor scent. It's not at all a bad smell but it's not a turn on either lol. Not sure if I would purchase the healing lotion but I'll definitely be buying the cream just to keep my hands and feet extra smooth. Now you can get the chance to win a Carmex skincare kit just like the one I received! 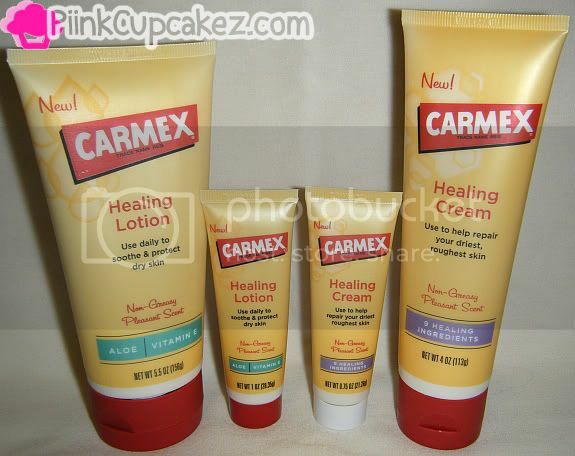 "RT @PiinkCupcakez Enter for your chance to win a Carmex Skin Care Kit! http://www.PiinkCupcakez.com"
Disclaimer: Products mentioned in this post were sent(free) by the company for review. I love Carmexl products!! I think I'm following on FB. Carmex is awesome, I was a faithful user for years until I found other things! I can't wait to try these... I love it for my lips and as a base to my lipstick. Ah, I need these soo bad! My hands would appreciate it. My facebook name is also Tamara Betancourt. Thanks love!